There’s nothing like raising a child. You get to be a witness as they slowly figure out how to grow into themselves, and it’s a truly amazing experience. But when you bring a new member of the family into your home, you’ve got to take into account the different areas of your home that might not be suitable for a young child. Your electrical system is a prime example. The things you have understood for years – don’t stick things in the electrical socket; don’t pour water on a live wire – are things your child hasn’t learned yet. So, it’s a good idea to take a few steps to child-proof your home to protect them until they learn how to approach these dangerous elements. Here a couple of ways to do just that! Like we said, a small child hasn’t figured out that the little openings on the plastic outlets in your walls aren’t there for them to shove things into. They’ll get shocked, and if they’re lucky, that’s all that will happen. Outlets are dangerous, so we recommend purchasing a set of small plastic outlet caps to put in the plugs. Small children can’t remove them – or at least, they won’t be able to before you stop them – and they’ll eventually learn not to mess with them at all. Although power strips are extremely useful, they present a hazard to small kids, who can trip over them or tinker with them and end up hurting themselves with all the plugs. To get rid of this problem, you can do a few things. Invest in dedicated power-strip covers. These covers, which are made of plastic, slide over the power strip and protect them from prying fingers. Another strategy is just to block the power strips with furniture. If a child doesn’t see the power strips, it’s unlikely that they’ll seek them out behind a couch and tinker with them. Even if you’ve taken every step to protect your child from preventable hazards like outlets and power strips, you can’t plan for everything. Sometimes, wiring frays and deteriorates, and when there are loose electrical components, your child can hurt themselves without even meaning to. Getting the help of a professional to come inspect your wiring and the rest of your electrical system is the best way to avoid this. They’ll identify trouble spots and recommend a way forward to solve the problem, keeping you and your family safe. 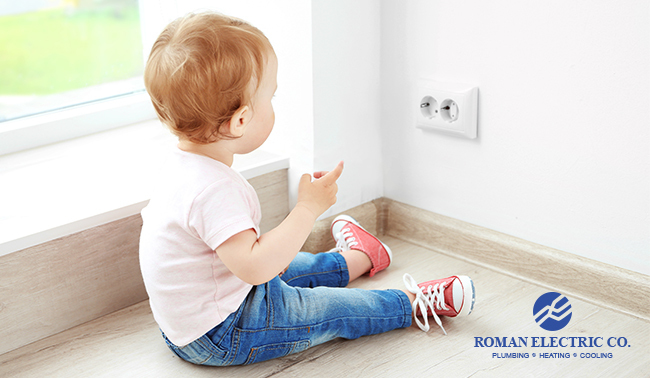 Roman Electric’s electricians can take care of all that, and more. Our priority is safety, and there’s a reason Milwaukee trusts Roman Electric to handle their concerns for 90 years. Give us a call at 414-771-5400 to schedule an appointment with one of our expert electricians to help child-proof your home’s electrical system! © 2019 All Rights Reserved. Roman Electric Co. Marketing for home services by Vitalstorm.